I strongly suggest an over/under in 12g. You'll be able to shoot anything from clays to geese. 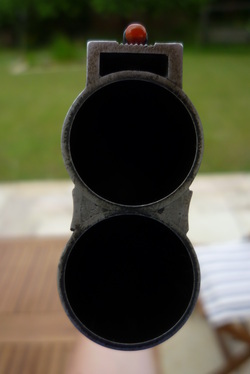 A side by side is no use for clays, and most are unsuitable for steel shot. Semi autos are are great in my opinion, but they’re not seen on formal shoots, and there are additional safety requirements to consider. As you’re new to shooting, I would suggest a 2nd hand gun. Then you won't loose as much money if and when you come to buy something more suitable to your requirements as time goes on. It’s also a very good idea to buy from a gun shop. Whilst you can legally buy guns privately from fellow SGC holders, it’s similar to buying a 2nd hand car. Not only will you get after sales service from a shop, but there will be a range of guns for you to try. The other thing to remember is that you will be buying cartridges etc from gun shops, so it’s good to find out which ones you like in advance. Some gun manufacturers to look out for are Browning, Berretta, Mirokou, Lanber, Laurona and Miroku. £500-£1000 will get you a nice 2nd hand gun, with little loss when (and if) you come to sell. You'll most likely be reading up on different types of gun and come across phrases like "length of pull" and "drop at heel". As someone who is new to shooting, you won't likely know what measurements are suitable for you. Don't worry about this - Gun shops worth their money will fit new guns for free and second hand guns at cost. If you're interested, I have written a brief page on gun fitting for further information. The “chamber” is where you put the shotgun cartridges and is an especially toughened part of the barrel. They are measured in either inches or millimetres, and the number refers to the length of the cartridge. A cartridge must be of equal of lesser length than that of the chamber to be fired safely. Otherwise the cartridge cannot open up properly leading to dangerously high pressures. It doesn’t have anything to do with the cartridge gauge. Old game guns have 2.5” (65mm) chambers, and most game cartridges are of this size. Most older over/under shotguns have 2 ¾” (70mm) chambers, and you will find that most steel and clay cartridges are of this length. This is the minimum chamber length you want, and will serve most people well. However many modern guns come with 3” (76mm) chambers. It’s worth buying a gun with a 3” chamber if you can as this will allow you to shoot a wide range of cartridges, but it isn’t essential if you don’t want to wildfowl. 3 ½” chambers are also available but only really needed in special circumstances (eg foreshore wildfowling). 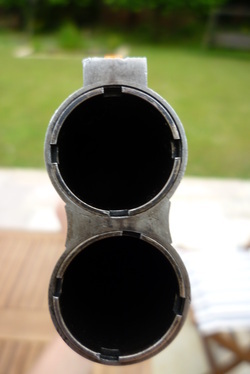 The choke is the constriction of the barrel at the muzzle. More constriction means the pellets will spread less over distance. These may be described as “cylinder, ¼, ½, ¾ and full”, of as “cylinder, improved cylinder, modified, improved modified and full”. In each case, the choke is becoming tighter (ie more constricted). Most commonly found on game/field guns. There is nothing wrong with this, although I would recommend not buying a gun with tighter than ½ choke if you intend to either shoot clays or steel. Does exactly what it says on the tin! You screw in the choke most suitable to what you want. As with fixed chokes, be careful when using steel shot. They can be a pain to clean however! In general, the closer the target, the more open you want the chokes to be. For clay pigeons, more open chokes are used (to make it easier to hit the target!) For live quary, tighter chokes are used so the animal is hit by more pellets ensuring a cleaner kill. It's worth remembering that different cartridges will give different patterns through the same gun, so it's always worth patterning cartridges if possible. By law, all guns sold in the UK must be in proof, and if you buy from a gun shop you can bet your bottom dollar it will be. Proofing a gun basically means that it’s been tested to make sure it can withstand the forces of being fired. There is real resistance within the shooting community of a total switch to steel shot as it would mean that a lot of older inherited guns could no longer be used very easily. 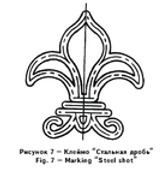 As a newcomer to shooting, I suggest you "future-proof" yourself by buying a gun that carries the fleur-de-lys steel shot proof mark. Shown right are the proof marks on my Browning. The middle crest is the proof mark of the Belgian Proof house. The C12-70 mark means this is a 12g shotgun with 70mm chambers. I suggest an 12g over/under with a minimum 2 ¾” (70mm) chamber and interchangeable chokes. If you want to shoot wildfowl, buy a steel proofed gun with a 3" (76mm) chamber as it's illegal to use lead pellets. You can usually shoot lighter steel loads through any modern gun with a 2 ¾" chamber or greater unless the box states steel proofed barrels are required. Barrel length is up to you. 28-32" will serve anyone well.